FEATURES: Gradual switchbacks, usually dry and shady, some native plants like ʻōhiʻa trees, groves of Cook pines, open ridges, summit view of the windward coast. I knew it was going to be crowded. And that’s precisely why I decided to do it. I don’t recommend hiking alone, though I do it more often than not — and more out of necessity and convenience than anything else. A lot of times — like on Friday — I make the decision to hike spontaneously, not giving anyone enough time to gear up and meet me at the trailhead. Solo hiking, though, can be a revitalizing, uplifting experience. I love being outdoors by myself, hearing the chirps of forest birds and breathing in the crisp mountain air without no one else around. That said, I’m always armed with pepper spray and a big stick — just in case. But on New Year’s Day, I figured hundreds of people would be hitting trails all over the island. It was the start of a new year, and many, like me, wanted to kick it off right. It helps that hiking torches the calories you’ve likely put on over the holidays, too. So I picked Kuli‘ou‘ou Ridge Trail, between ‘Āina Haina and Hawai‘i Kai, for two reasons: One, it’s a fairly easy, non-treacherous hike to a summit lookout that offers great views of the windward side; and two, though I was hiking alone, I could guarantee I really wouldn’t be. A word about the trail itself: Kuli‘ou‘ou Ridge Trail is one of a handful of state-managed trails that end at a summit atop the Ko‘olau Mountains. Of the three that traverse this stretch of the range, this five-mile hike is slightly longer and a tad more difficult than Wiliwilinui Ridge but easier than Hawai‘i Loa Ridge. It’s also easily the most popular, with its gradual switchbacks and shady paths. This trail traverses a public hunting area. Here’s the hunter check-in if you want to see if there’s hunters on the trail while you’re hiking. I got to Kala‘au Place just after noon on Friday, and the entire stretch of road was already lined with cars. Hikers were parking on Kuli‘ou‘ou Road and walking up the steep street to the trailhead. Luckily, I found parking just at the bottom, after another car had pulled out. So for me, the hike began here. The trail at the start. My favorite part of the beginning of the trail, where you can see Kuli‘ou‘ou Valley and the blue skies overhead. This trail traverses a public hunting area, and it’s also open to mountain bikers and dogs on leashes. So there can be a lot more going on along this trail than just hiking. There are two trails here. Kuli‘ou‘ou Valley Trail is a very short and shady two-mile walk along a well-groomed and graded path through this leeward valley. It’s perfect for beginners or families. The ridge hike, which veers to the right, is more challenging, with switchbacks that zigzag to the summit of the Ko‘olau. The switchbacks start almost immediately, and they offer the easiest way to climb a steep ridge like this one. But you have to pay attention, as some of the turns aren’t super obvious. And avoid the shortcuts that cross these switchbacks. While I’ve done them — I even cut across a few this time — using them can cause erosion that damages the trail. And to be honest, some aren’t any shorter than walking along the marked trail and others may not even be shortcuts at all. Case in point: I was following a group of college coeds from Russia. At one point, going down, they took every shortcut they could find. I stuck to the path and still caught up with them. Then they took another trail that appeared to be a shortcut — and I never saw them again. Either that was the worst shortcut in the world — or the best. I will never know. The path weaves through ironwoods. Much of the first part of this hike is dry and shady like this. The push to the summit starts here. 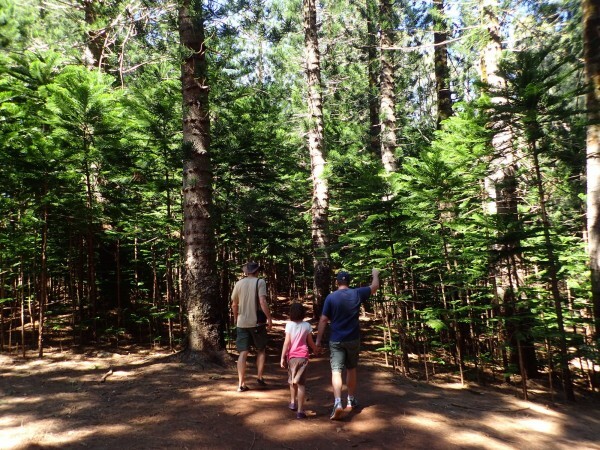 A family walking through the grove of Cook pines. The covered picnic tables offer a great resting spot for tired (or hungry) hikers. This next part of the trail gets a bit more challenging — but the payoff is well worth the extra effort. The climb here is significantly more difficult — and there aren’t any switchbacks here to make the trek easier. Totally gratuitous shot: dogs! There were at least two dozen dogs on the trail when I hiked. It’s a great place for them to explore. You’ll encounter more native trees and plants on this part of the trail. As on both Wiliwilinui and Hawai‘i Loa ridge trails, the final ascent is marked with stairs. These steps are maintained by the state’s Nā Ala Hele program and the Sierra Club of Hawai‘i to slow erosion and make it safer — and easier — for hikers to climb to the summit. There are just about 300 steps on this trail to the top, which really isn’t too bad. You might hate the steps, but they actually make it easier for you to reach the summit. I gotta say, it was a gorgeous day for hiking. You always need to look back sometimes. It’s the last set of steps that will undoubtedly be your hardest. Not just for the fact that it comes after an hour or so of hiking, but by this point, you’re desperate for the finale. You want the payoff — but don’t worry, it’s coming. Here, you’ll be rewarded with stunning views of the windward coast. It took me an hour to reach the summit — I booked it! — and the last push was so worth it! The red-dirt summit, which sits at about 1,700 feet above sea level, will welcome you with a blast of cold air. At least it did for me on Friday. It was like standing in front of an air conditioner. The air was that chilly. And after an hour of scrambling to the top, I wasn’t complaining about it, either. The view is just as spectacular as people say. From the summit, you can see Kailua, including the offshore Mokulua Islands, the long stretch of Waimānalo, Mānana (Rabbit) Island and even Koko Crater to the south. It was so clear that afternoon, we could see Moloka‘i, Lānaʻi and Maui, too. It’s a fairly wide summit area. By the time I got there — around 1:15 p.m. — there were about a dozen people (and two dogs) taking in the view. But even with all the hikers, I could still find a quiet place to myself, where I could gaze out over Waimānalo and the azure ocean and be thankful for everything around me. We really are lucky to live here, and I don’t ever take that for granted. What a great start to 2016! VERDICT: This is a great trail for novice to intermediate hikers. Two-thirds of the trail is comprised of switchbacks, which make it easy to climb the ridge. And the last push, which involves steps (but no ropes! ), isn’t very long or steep. But veteran hikers shouldn’t scoff at this trail: it’s got everything you could want in a hike — native forest, challenging sections, panoramic views of the windward and southern coastlines — just minutes from town. And it’s not too long; I finished this in two hours, so it’s a doable in a relatively short amount of time. As someone who’s spent a lot of time in the past maintaining trails, I echo your recommendation against taking shortcuts. Trails are typically designed with switchbacks not just to make them easier to hike, but also to reduce their impact, minimizing the erosion caused by the trails and the damage done to the plants and whatever is downhill of the trails. I veered right. And it only took me about a mile to figure out the misstep. Sigh.